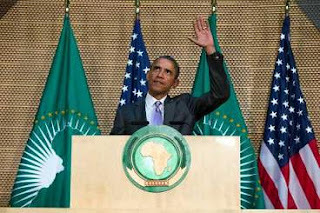 “As Africa stands against terror and conflict, I want you to know the United States stands with you,'' Obama said in a speech to the African Union, highlighting threats ranging from Somalia's Shebab, Boko Haram in Nigeria, insurgents in Mali and Tunisia, and the Uganda-led Lord's Resistance Army rebels in central Africa. Obama said the United States was backing AU military efforts and saluting the “brave African peacekeepers'' battling militants. “From Somalia and Nigeria, to Mali and Tunisia, terrorists continue to target innocent civilians,'' he said at the African Union headquarters in Addis Ababa. “Because of the AU force in Somalia, Al-Shebab controls less territory, and the Somali government is growing stronger. In central Africa, the AU-led mission continues to degrade the Lord's Resistance Army,'' he said.